Centrefeed Blue Rolls are ideal for use in commercial or domestic kitchens where food is prepared. 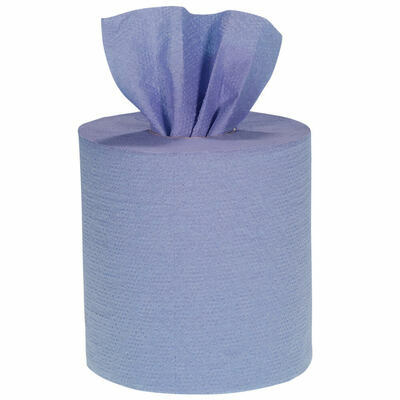 Our 2ply blue rolls are great for absorbing spills, drying hands and wiping down surfaces. Each roll has a removable cardboard core so it can be used in our Centrefeed Dispenser, or it can be placed on a worktop, perfect for portable cleaning. Each blue roll measures 115m in length, ideal for high volume users and it is made from recycled paper material, with CHSA accreditation. Centrefeed Blue Rolls are a cost effective disposable product for use in a wide range of applications, not just kitchens. It is one of our best selling products to nurseries, schools, builders, caterers, cleaners restaurants and hospitals. To remove the core from your Centrefeed Blue Roll, place it down on the surface and rotate it until you can see the seam of the cardboard. You can split the seam by pushing it outwards with your thumbs or fingers. Once the seam has been split, gently pull the cardboard and it should start to unravel. If the seam is hard to split, we found the best way to remove the core it is to squash the roll, this breaks the shape of the cardboard allowing you to get your fingers between the paper and the core. Once removed, the roll goes back to its usual shape. Now the core has been removed your Centrefeed Blue Roll will feed from the centre so it can be placed inside a dispenser, or placed on a worktop. The bright blue colour makes this roll perfect for use in the kitchen as it is easily detectable, like our Blue Plasters.